Today is the launch of my new collection of accessoried, Nordlándda, from The FIbre Company. I'm going to be blogging about each of the pieces from the collection over the next few weeks, but I wanted to show them all to you as a whole. 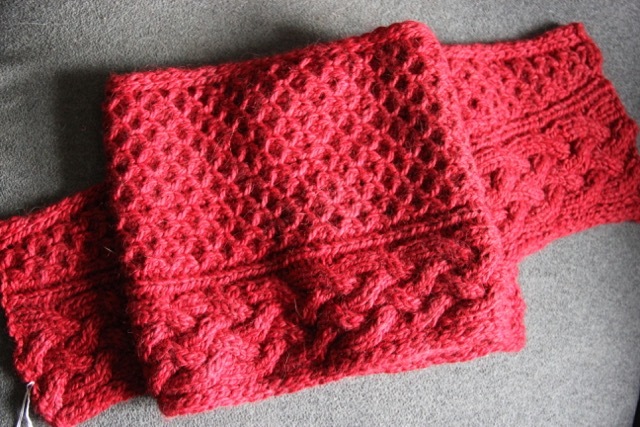 By the time this post goes live, the patterns will all be available on Ravelry. I'll get them up shortly over here. In the meantime, I hope you like them! If you're interested, A Yarn Story is kicking off their #AYSWInterCablesKAL with this collection today, so come on over and join in! ETA: the patterns are now up on the website, so if you'd like to purchase them without paying VAT, head over here! If you include your Ravelry ID with your order, I will gift you a pattern for your library in addition to email you the pdf. Thanks! I've just returned from a trip to the post office, to send out a very special pile of knitwear. It's been a bit of a crazy few months while I've been working on this collection. I've had a few shows, looked at a lot of very expensive and not very nice property, been back to the States on a scouting trip against the possibility of moving back next summer, seen family, come back, put on a Yarn Crawl and Marketplace, seen more expensive real estate, starting visiting secondary schools with my daughter, put in an offer on a house, had the offer accepted...you get the idea. And all the while I've been plugging away at this accessory collection, in the fantastic Tundra from the Fibre Co.
As the pieces have only just gone off for their photo shoots, I'm not going to reveal too much, but I will share these details: there are three hats, two pairs of fingerless mitts, two cowls (one of which comes in two sizes) and a long, narrow shawl. All of the pieces have cables and texture - some are all over, some have just one focal cable, some have an all-over cabled pattern. All are worked in bulky weight yarn, so they knit up super fast. They all take between one and three skeins of Tundra, and are super soft and squishy. Over the next few weeks I'll share more details of each piece and the construction, but I didn't want to go much longer without letting you know that I'm still here, and there is still lots and lots of knitting going on.